The first part of the trek was behind us. After three days of strenuous hiking on steep trails, fighting travel fatigue, stomach cramps, and diarrhea, a rest day in Sibuje was very welcome. In fact, I could not imagine a more serene and picturesque village. Sunrise in Sibuje is a magnificent sight. The valley shown here is the valley we would follow the rest of the trek, all the way to Mera Peak. Life in Sibuje is simple in many ways; easy it is not. The 16 families in Sibuje must work very hard for everything they have. They build their own homes and grow their own food, preserving many of the farming techniques used for centuries. They cook over wood fires that also serve to heat their homes. The hillsides surrounding the village are dangerously thin of trees, a result of deforestation for firewood over the years. 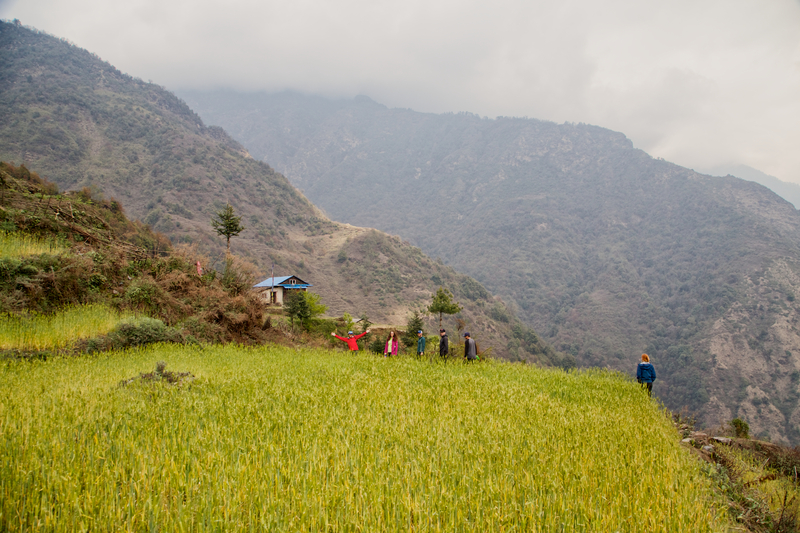 To help prevent future deadly landslides (Karma’s Aunt was killed 20 years ago by one while sleeping in her home), villagers must walk at least an hour each way to gather firewood. People (mostly kids) are constantly making the journey back and forth all year long so that they have enough wood come winter. 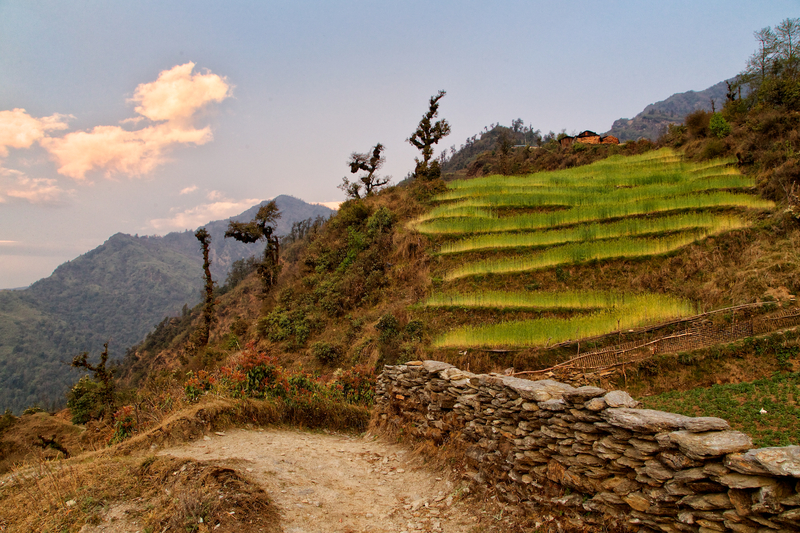 Villagers have built terraces into the steep hillsides. Farming here is challenging, but it is how people have survived in villages like this for centuries. Despite the hard way of life, the people of Sibuje have a warmth, friendliness, and happiness I have never seen before. They value hard work, family, and a light-hearted silliness that leaps into form as dancing and joking with friends, family, and guests. I have never felt more quickly and wholeheartedly welcomed by strangers into their homes. 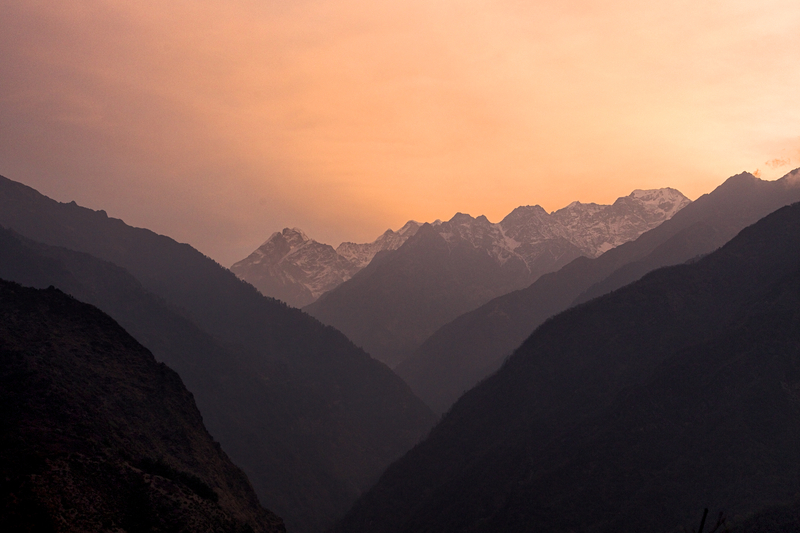 The building on the right is the home of Pasang Sherpa, my friend and porter for the trek. After staying up very late photographing the stars and then sleeping in the yard, I was roused by Pasang coming outside. When he saw me, he immediately offered me a cup of tea. His hospitality and friendliness were a perfect start to the day. Life in the village also seems uncertain. In the last year, two families have left due to hard times. Karma took us in the morning to talk to two separate village elders to get their perspectives on the village and the challenges they face. They know that their way of life is threatened. To help, they seek some modern solutions while holding fast totheir culture and tradition as they can. Karma walks the group around a buckwheat field on the way to visit some village elders. Buckwheat is a mainstay in the village. The flour can be roasted in a pan and made into a thick porridge that is higher in protein than almost any other food. It also tastes amazing! The first home we visited was the home of one of the oldest families. The husband was out in the hills tending to their cows. We spoke with the wife, Pemdigi Sherpa. When we asked her age, she said that she is in her 80’s. 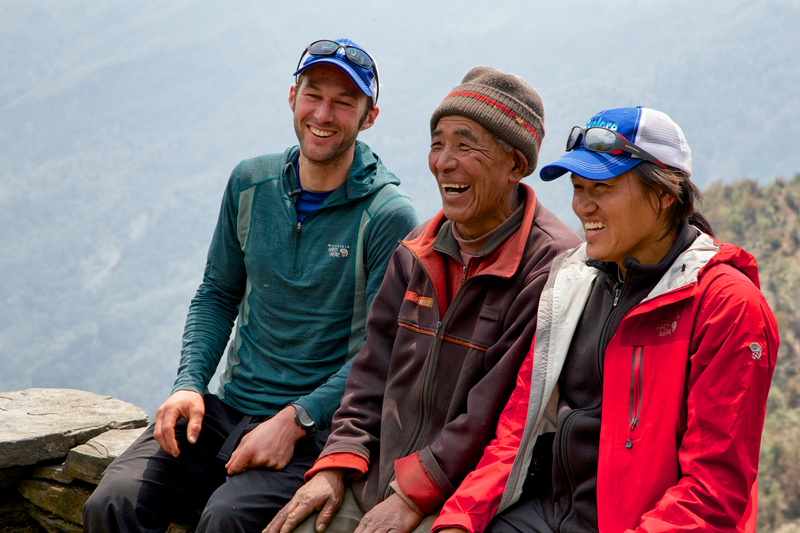 It is difficult for many Sherpa people to tell you their exact age. Because many do not have birth certificates (a trip to Kathmandu is required by the father of a newborn baby to get one), and they use a different calendar, much confusion can arise. Pemdigi Sherpa is a wonderful old woman. 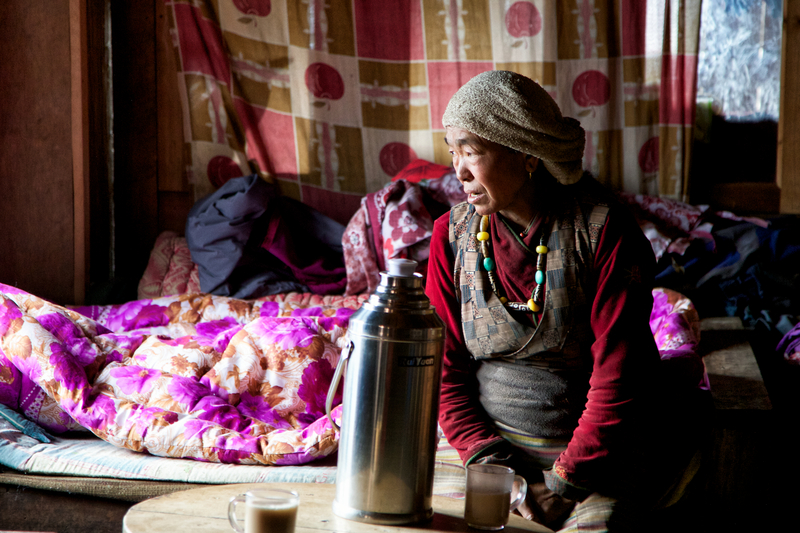 She quickly welcomed our whole group into her home for tea while chatting casually about the helicopters flying overhead all morning (a rare sight in the village brought about that day by the sad events happening on Everest). She smiled warmly as she recalled the first time a small group of tourists came to Sibuje, more than 20 years ago. She said she came outside one day to find several tents on the nearby terraces. She and her family were a little shy at first, but became quick friends with the adventurous visitors from strange lands. Ever since, tourists have been welcomed into the village wholeheartedly, although infrequently. Since Sibuje is off the typical trekking routes by a couple days and has no lodges, it is visited by very few tourists. Nevertheless, locals love to meet people from the outside world and hear about their lives. Pemdigi Sherpa tells tales of the first tourists to visit Sibuje. After having salt tea (a Sherpa mainstay) with Pemdigi, we walked through some more pristine fields and climbed some very steep (of course) hills to get to the home of Dorje Sherpa. Dorje is a man of approximately 65-70 years with a serious demeanor that can turn into a childlike laughter at the drop of a hat. Glen, Dorje Sherpa, and Karma Sherpa get their ‘silly’ on. Dorje has done fairly well for himself and family. With that said, he spoke of many of the challenges echoed by everyone in the village. Water. It is a common refrain I have heard from people in the mountains close to the sources and from people all over Kathmandu valley. Access to fresh, clean water for crops and drinking is becoming a major problem. 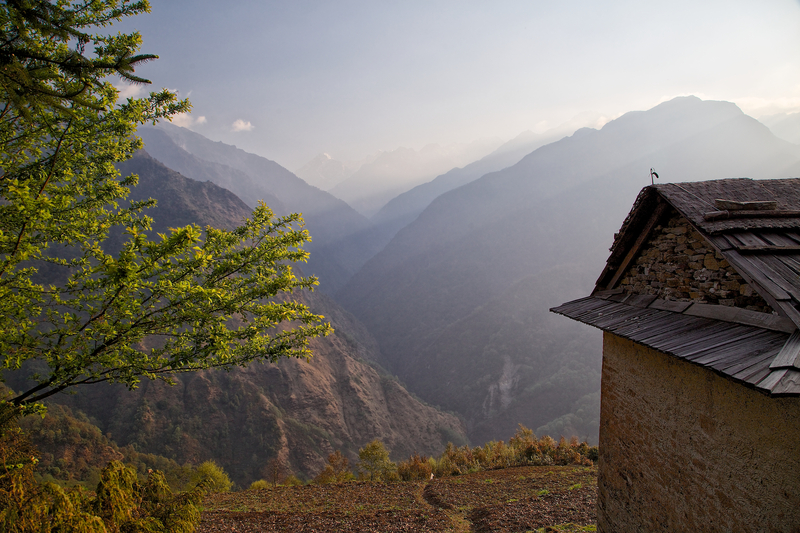 Sibuje gets its water, like many Himalayan villages, from a nearby stream. Unfortunately, during many parts of the year, the stream dries up – either because the source is frozen in winter, or because the fall and spring seasons are too dry. The summer months bring the monsoons. Once a welcome restoration of the moisture needed for farming, the recent intensity of monsoons has resulted in too much water and landslides. 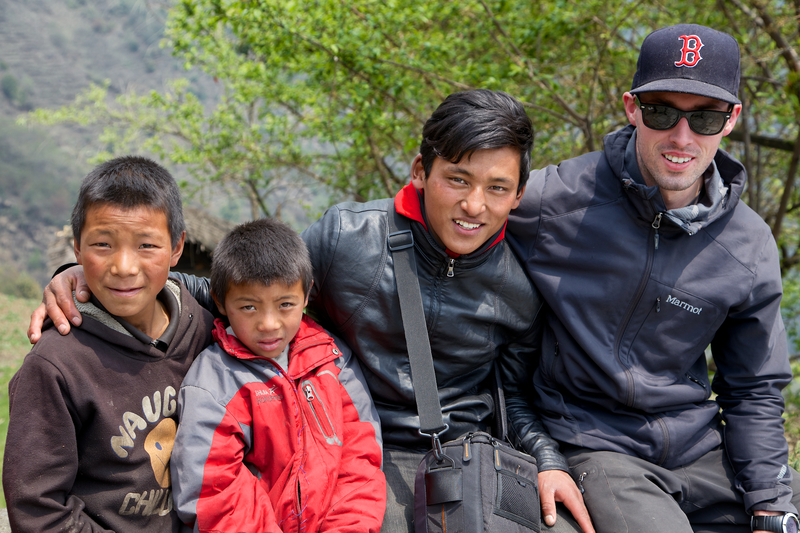 Some of the local kids supervise the filming at Dorje’s house. I was never short on helping hands. In addition to water, Sibuje is in need of electricity so that their kids can study at night. Sanitation systems are non-existent. The villagers are frequently getting sick from bacteria, and a way to more efficiently heat and keep their homes warm is needed. Infrastructure is not the only shortcoming. In order to help raise needed revenue for the village, many of the younger generation seek education so that they can work in the tourism industry when not working in the families fields. However, to get an education past third grade and to learn English, as absolutely necessary to succeed in tourism, kids must be sent away to a village half a day’s hike away to live with a host family. The expense is far more than most locals can afford. Ang Rita Sherap and Andrew hanging out with the kids. Later in the day, we attended the local primary school, which teaches through grade 3. The teacher is funded by a foreign NGO, and his salary is sadly not guaranteed for next year. Regardless, Karma and the rest of us were invited to a celebration. A generous Japanese friend of Karma’s donated school uniforms for the kids, so everyone was in high spirits. The next post will highlight that wonderful afternoon when Karma got to bring them the uniforms!